It's fall and we all want to curl up with something satisfying to read. I have just the book for you: The Memento by Christy Ann Conlin. The Memento was a great accompaniment to my trip to beautiful Nova Scotia last summer. 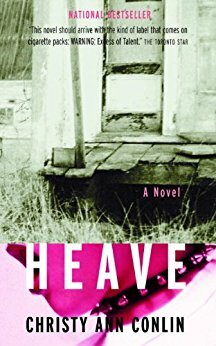 As some of you know, I'm a big fan of Conlin's work, and if you enjoy this then I suggest you read her first novel Heave, one of my all-time favourites, especially if you love the recklessness of youth (with an explanation, of course). HL: The Memento is your second adult novel since your bestseller Heave (for my review, scroll to the bottom of this page). Although both are set in rural Nova Scotia on the Bay of Fundy, they are very different novels. Heave moves pretty fast, while Memento is more of a slow burn, an old-time novel with plenty of twists and turns, some elements of a ghost story and a suspense novel, but I wouldn’t put it in either category. We caught an earlier glimpse of the Moshers in Heave. I remember a conversation with you a few years ago on social media about your next book, and you said it would centre on Fancy Mosher and the island. That wild island with its crashing waves and ragged cliffs certainly figures prominently in this story. I wanted to know about the genesis of this book. How did it all come together? Christy Ann Conlin: Ah, yes, the island. I grew up in a region (and a family) steeped in storytelling, where there are stories for the unexplainable. My family has always had a fascination for historic buildings and antiques. And we grew up looking out over the legendary Bay of Fundy at a mysterious island which would loom out of the fog. There is no doubt that my creative landscape has been shaped by this. And yes, The Memento is a book which defies categorization, ha ha. It reads like a historical novel and yet it is not. It is both coming of age story, and a life reckoning story. And it has elements of magic realism. There were a number of factors which drove the creation of the book. First, it was totally character driven, by Fancy Mosher, who appeared in Heave as a minor character. She fascinated me, the youngest of twelve children, growing up in a poor family immersed in an old world tradition which persisted in modern times. There is a scene in Heave where Fancy tells a ghost story that takes place out in the bay on a mysterious island. It was that moment, when I realized Fancy Mosher had a secret. Despite her poverty and tumultuous childhood, she had humour and insight, and an uncanny ability to see the truth. HL: The Moshers' and the Parkers' lives are intertwined, the extent of which is unknown until the very end. Fancy is at the bottom of the pecking order while she works in service at Petal’s End. She is the recipient of some stinging comments and hurtful actions by both other staff and some of the Parkers. In many ways, she cannot escape the actions of her mother, Marilyn. Yet, Fancy assumes her rung on the social ladder, possibly because she has no choice. I found your portrayal of class differences in The Memento both subtle and very realistic. I was wondering where you found your source(s) of inspiration for these class differences? Christy Ann: Both class and gender restrictions/expectations are invincible powers restricting and shaping female lives. Even when you want to flee the abuse, take shelter and find something new, you often find yourself in a labyrinth which just leads you back to where you began. My early introduction to delineated class society was from reading novels, from English authors like Jane Austen, the Brontes and EM Forster to the society novels of Edith Wharton and the short fiction of Katherine Mansfield. And later watching DVDs of Upstairs Downstairs. And, of course, my mother took me to visit the grand old Nova Scotia estate museums of Mount Uniacke, Prescott House and Haliburton House. In those museums, we could see where the servants lived, and just how much work was involved to keep the homes running. And of course, back then, without transportation, servants were essentially trapped on the estates. Fancy is born into a working poor reality. Her family’s past is considered her past. She inherits a low social standing and she also inherits a macabre family ability. Although she lives in modern times, she’s still bound by poverty and living rurally. The Memento looks at what we are born into and our response to it. It takes a very strong person to question and ultimately overcome a prescribed role. And it’s not just class, but gender. Fancy has very few opportunities not just because she’s poor, but because she’s a poor female. Poor women have historically had to work, and often in the same jobs that their mothers have worked in. Jenny Parker, the youngest daughter of the aristocratic Parker family, is also bound by severe class and gender expectations. She is disabled, unattractive and lacks charisma. She’s a throw away person in society. And yet Jenny also subverts the rules and expectations placed on her in a most unexpected way. Pomeline, Jenny’s older, beautiful and privileged sister, is not so lucky. The expectations on her are her undoing. I grew up in a very rural and economically depressed area. It was also very racist and sexist, traditional and segregated. Growing up in the 1970s and 80s in North America was, obviously, very different from living on an English country estate either as a lady or a lady's maid, or a scullery maid, as I no doubt would have been. But there is an invisible class system at play here, one I only fully began to comprehend when I was in high school.The opportunities for a girl were so much more limited. There was a lot of pressure to do a “pink collar” job – to be a nurse or a teacher or be a secretary, to work with children. We didn’t have a lot and there were hard times as a result. And when you don’t have a lot, you get a part-time job, if you actually have a way of getting to the job. This is always an issue when you live rurally. It’s too far to bike or walk. I remember being so envious of friends who lived in towns, or who got cars when they were sixteen. HL: Your next project, I gather, will be quite different. Rather than the classic slow-burn type of read, this next book will have more suspense. What can you tell us about your upcoming project? Christy Ann:The book I’m working on now is very distilled. It’s a literary mystery! It explores the friendship, estrangement and reunion between two women who first met many summers ago in a seaside town and uncovered a horrible truth behind a forgotten family death which binds them together in a web of betrayal, beauty and violence. 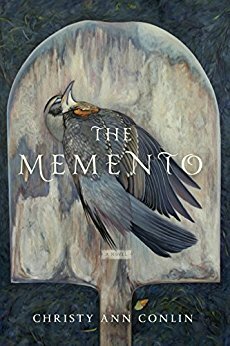 : A Fall Read: The Memento by Christy Ann ConlinTweet this!